← Vernazza, Cinque Terre, Italy. 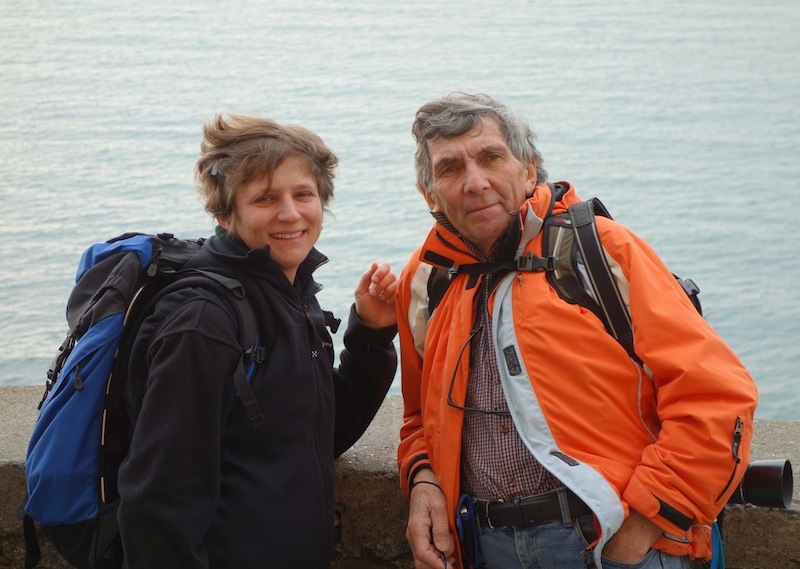 Today until 3-00pm I stayed indoors writing while Bev and our hosts went walking. The hold up with postings is not so much on my part with regards writing nor with Bev editing and doing the actual post, it’s more to do with unreliable Internet connections. 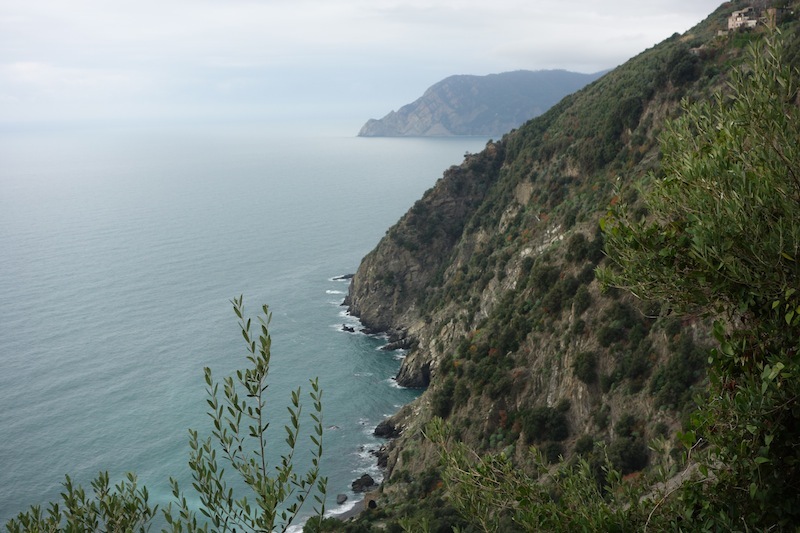 Today I learnt that Monterosso al Mare came into being in during the 8th and 9th centuries and since then observation towers, fortresses, convents, churches and sanctuaries have sprung up within and around the town. 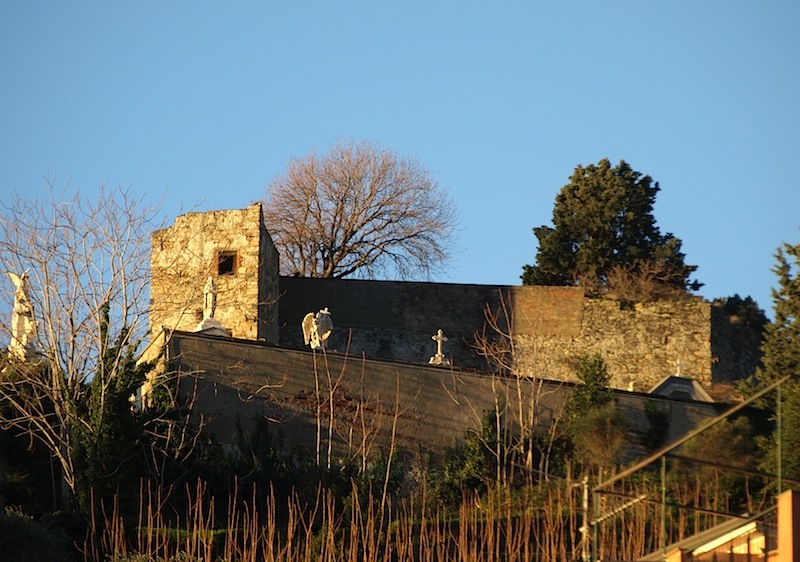 The sanctuary on a nearby hill is of special note as it is built on a site where a priest miraculously discovered a small statue of the Virgin. This was taken as a sign that the spot was holy so in the 15th century a Madonna was placed at the site. The faithful still climb the hill to visit the Madonna. 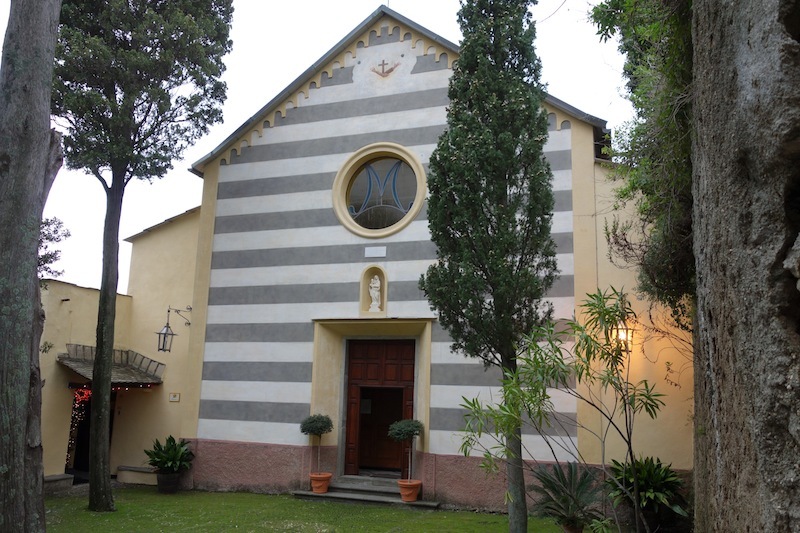 One of Monterosso’s hilltop churches. I enjoyed my time alone this morning but when Bev returned from her walk she insisted I visit the cemetery she visited earlier in the day. I have to say I didn’t feel comfortable in the cemetery for a number of reasons. 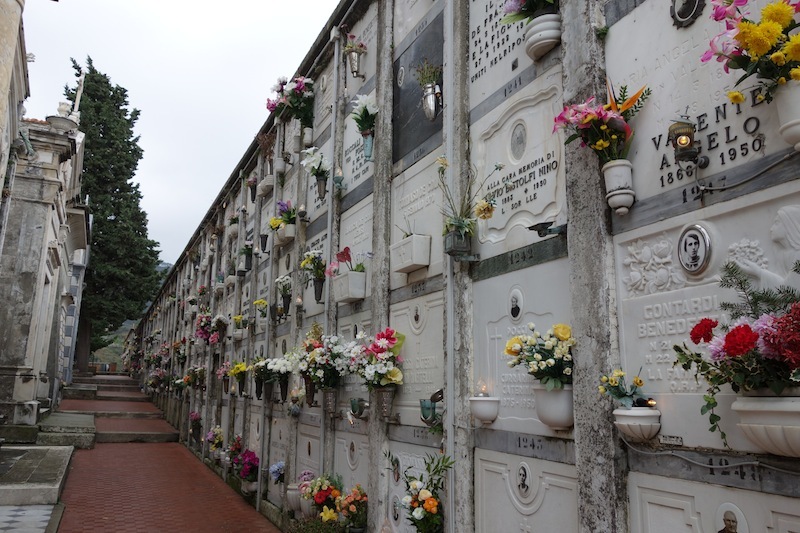 It was cold and damp, the monuments were overpowering (Italians take memorials to the deceased very seriously) and I think it was all the photographs of the deceased on the tombs and headstones. The photographs gave the place a connection with reality. By that I mean how insignificant our stay on the planet is. 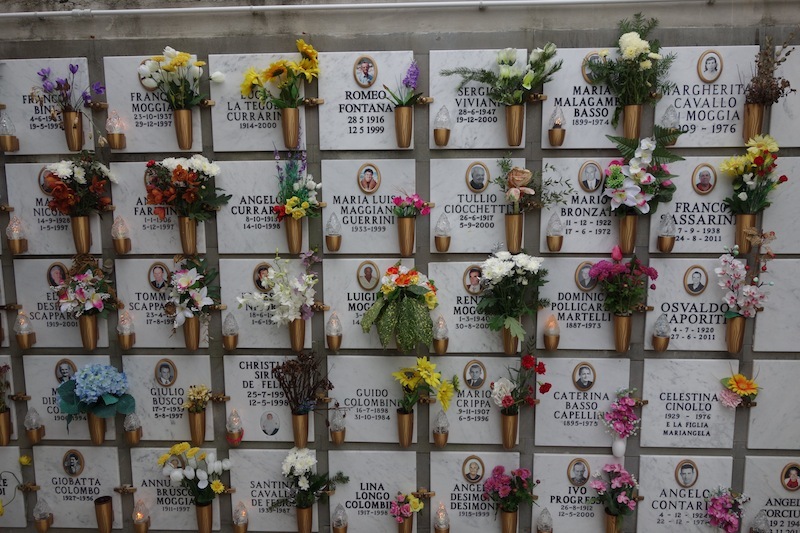 I’m not visiting any more Italian cemeteries. Sitting on the hill next to the cemetery and looking down on the village draws one’s imagination back to past centuries when life would have been a lot tougher. In those days life would have revolved around survival. There have been a lot of changes since those days but one thing that hasn’t changed is the sound of ringing church bells. The cemetery on the hill. 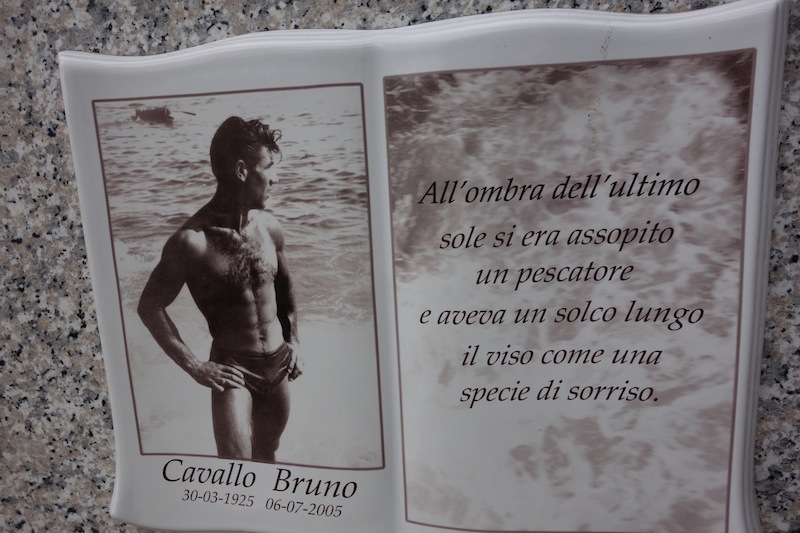 Photo of deceased on a headstone. 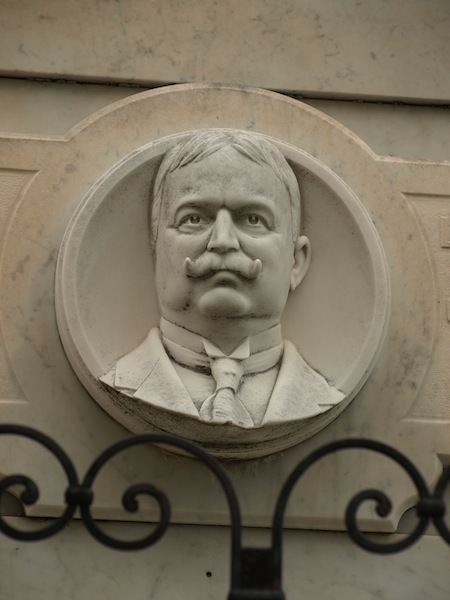 It is well known in the headstone masonry world that the Italians have perfected the art of photographic images on stone. Best enlarge this image to see the reality of life. More realistic than a photograph image. I wonder if the deceased really did only have one ear. From the cemetery we made our way home along the narrow twisting alleyways. Returning from the corner store. 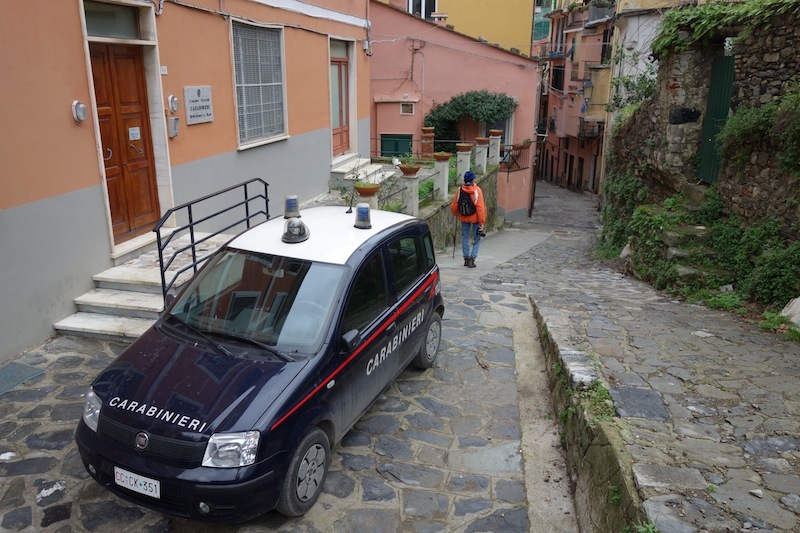 Along the way we found the Carabinieri (police) station. To get the police car out would be a tricky operation. 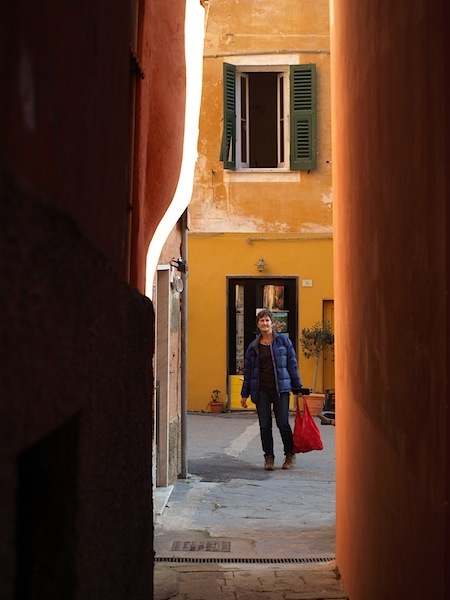 It meant backing down through a very narrow alleyway (the one I’m walking down) and at the bottom negotiate a right angle bend. 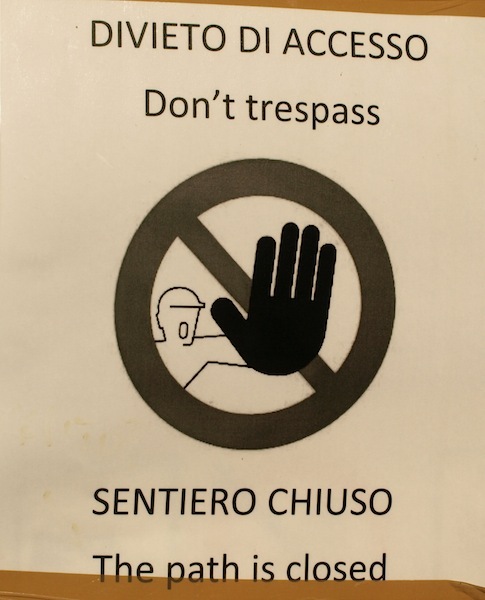 It would be impossible to make a high-speed exit. The police car and the narrow alleyway. 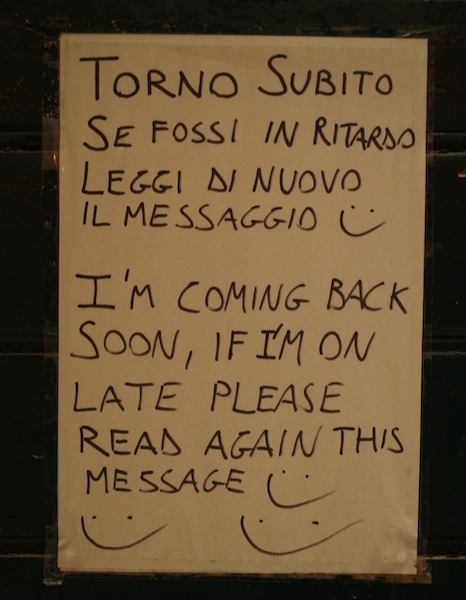 Sign on a shop door. Nearing our apartment we discovered an Internet café. 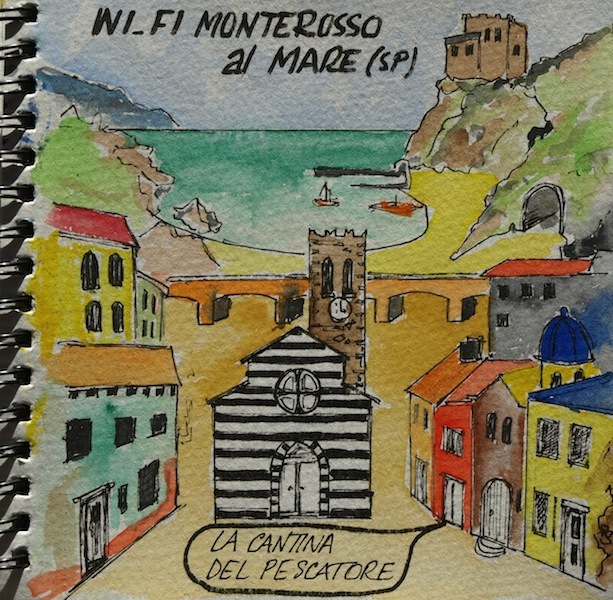 If any readers are venturing to Monterosso you must go in. Not only can you check your emails but you can blog, take a wine, beer, tea, coffee and Bev’s favourite, a very thick hot chocolate. The owners are friendly and the bonus is they speak our lingo. I did this sketch from an ink drawing on a La Cantina Del Pescatore leaflet. Apologies to the original artist. 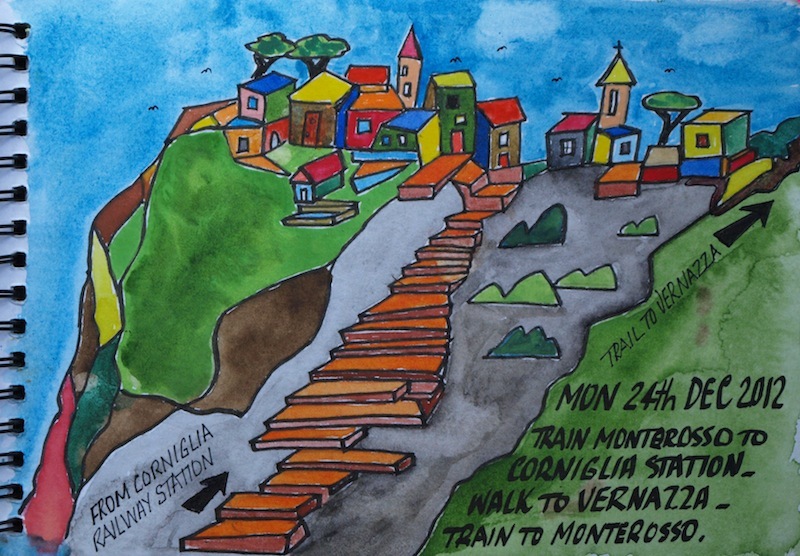 Train to Corniglia and a walk back to Vernazza. 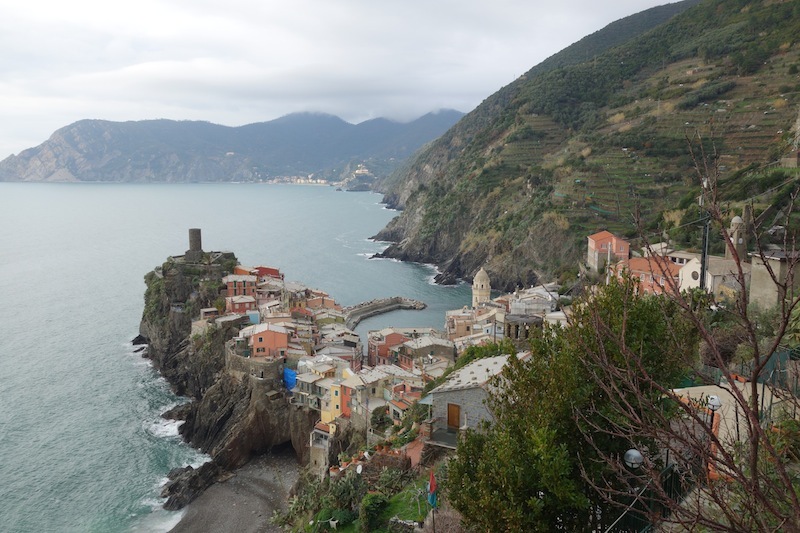 We began our walk at Corniglia and after a look around the village we set off on the trail to Vernazza from where we caught the train back to Monterosso. 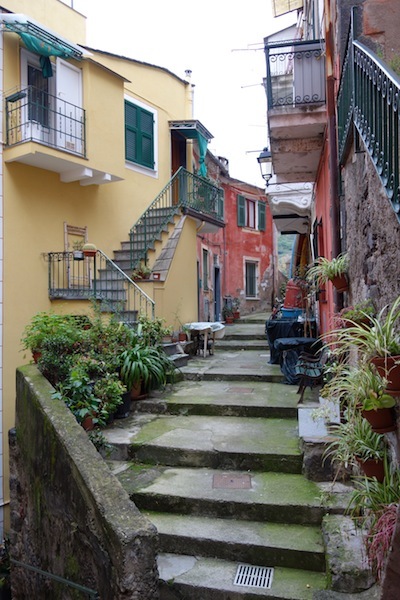 Corniglia is a town similar to the others scattered along the coast in the Cinque Terre but with two striking differences. 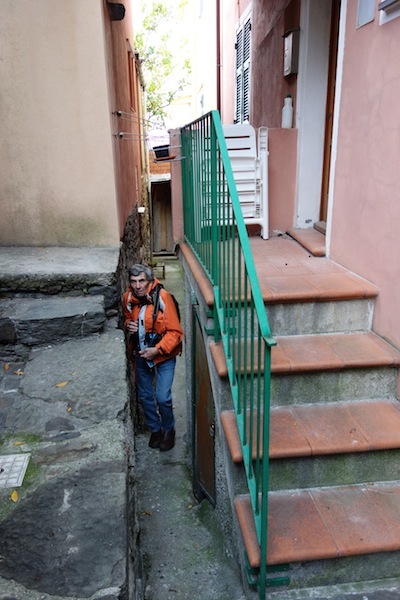 There are no cars because the laneways are simply too narrow to allow passage and it doesn’t have easy access to the sea. 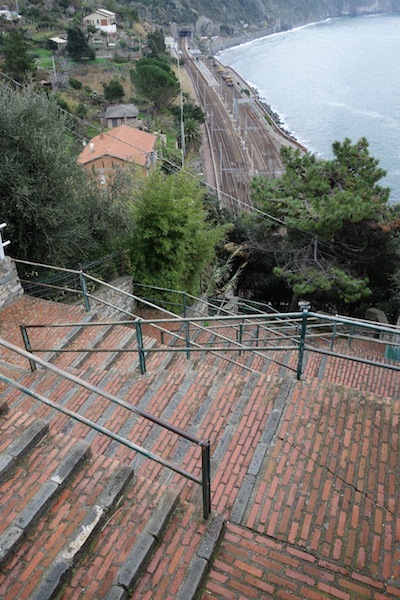 Access to the village from the railway station was up a steep set of steps. 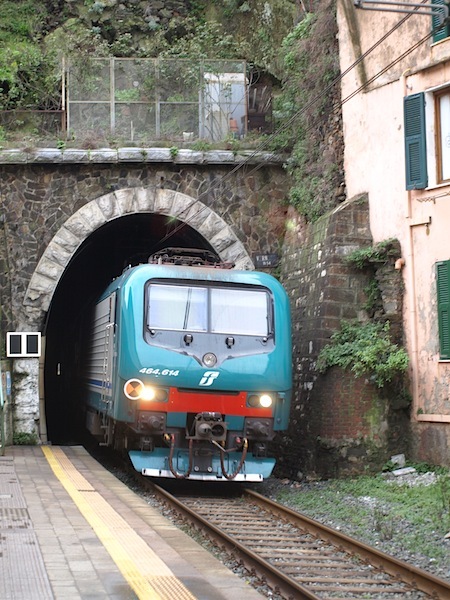 For the train buffs, the Genoa to La Spezia express. 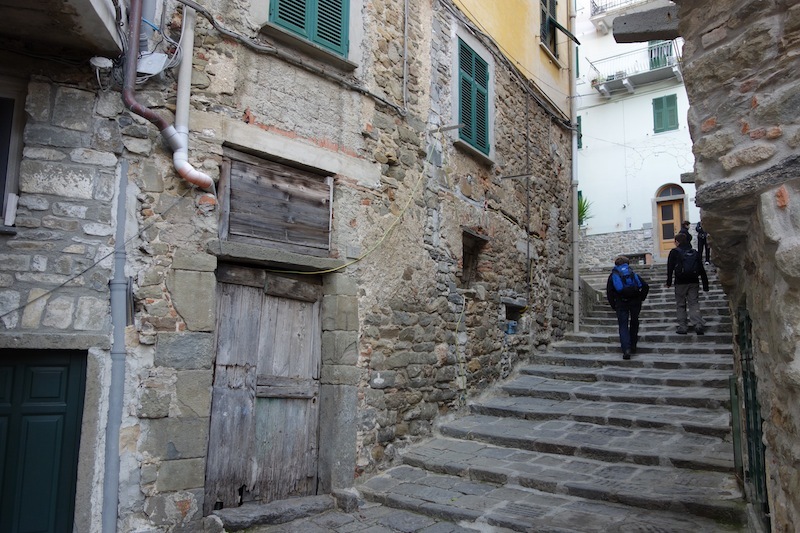 This is how I saw the 368 steps to Corniglia village. Part way up the hundreds of steps. 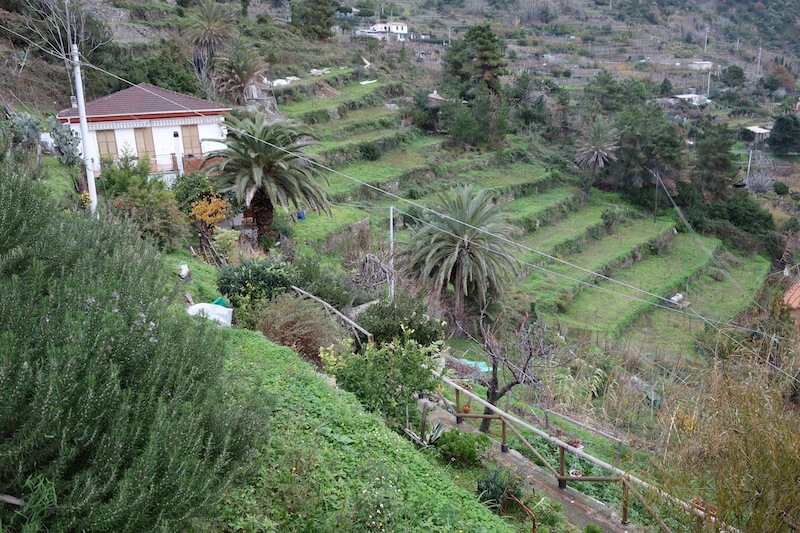 Terraced farming plots on the way to Corniglia village. The predominant crops appear to be olives, citrus, grapes and cactus fig (prickly pear in Australia). My readings on prickly pear indicate that there is a compound in the fruit that is detrimental to the kidneys; we best not tell the locals lest they worry. Very well executed random rubble retaining wall. The vertical stone post set in the retaining wall will, I expect, have a trellis attached to it sometime in the future. Lugging the groceries to the house above would be a mammoth effort as it was about halfway up the hundreds of steps. 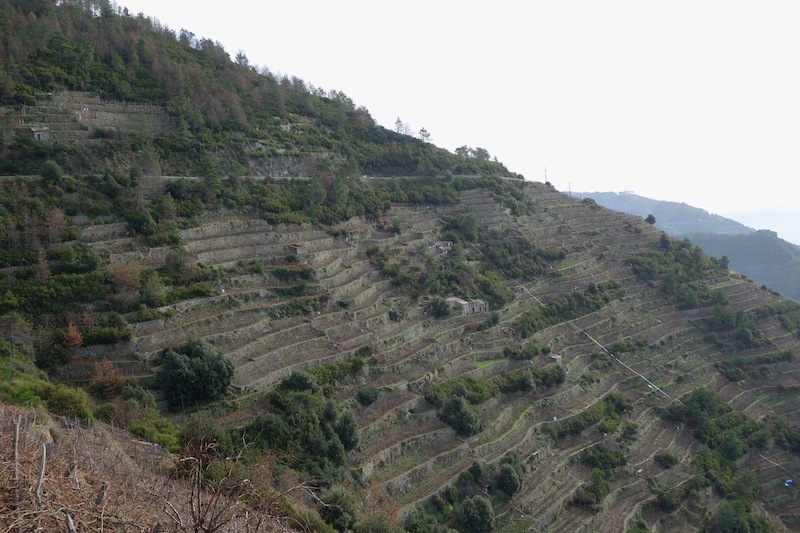 To terrace a hillside like this you would have to be desperate for arable land. Before the rack and pinion invention I expect donkeys would have been used to take supplies up and or down. Rack and pinion trolley, the alternative to lugging supplies to and from the villages. 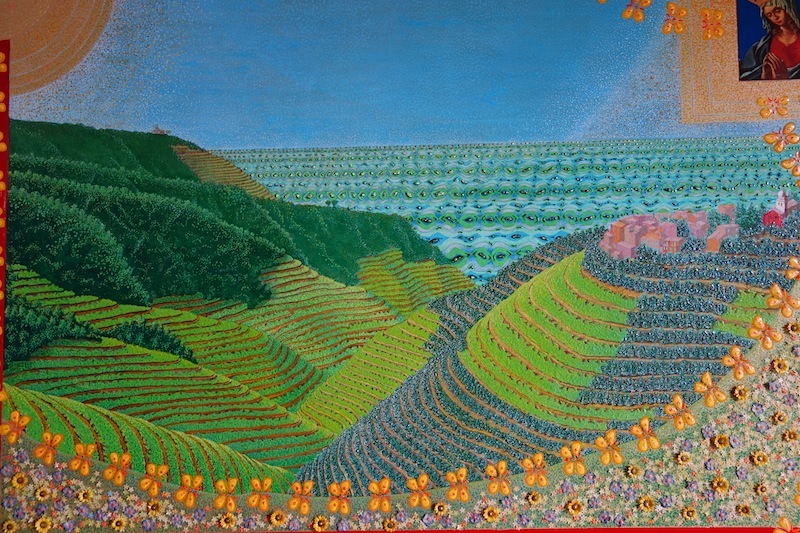 A painting depicting a terraced hillside of the Cinque Terre region. The sun and the Virgin Mary look down on the Garden of Eden. There was not just one garden of Eden but many scattered between the bible lands and Asia. When I post the story relating to my Colombo (Sri Lanka) to London drive in 1970 I will tell you more about various Gardens of Edens. 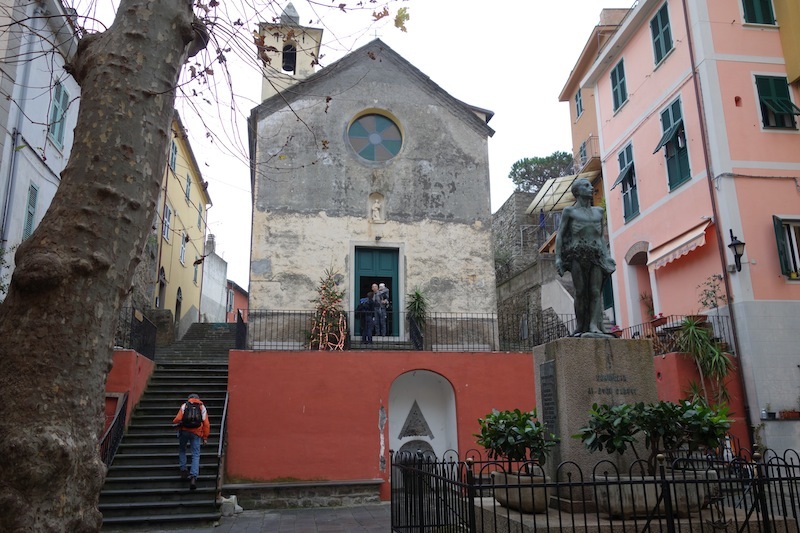 Corniglia village square dominated by a simple church. 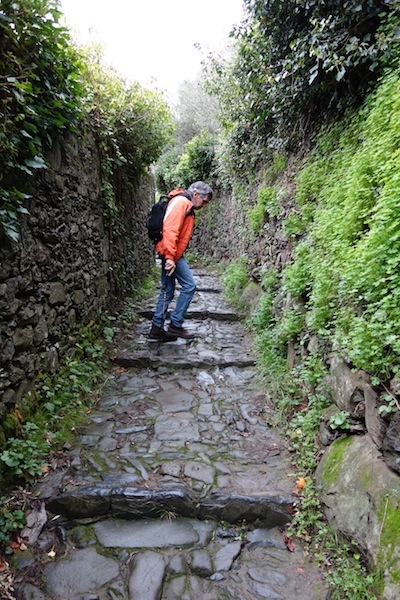 There were some pretty narrow squeeze ways in Corniglia. 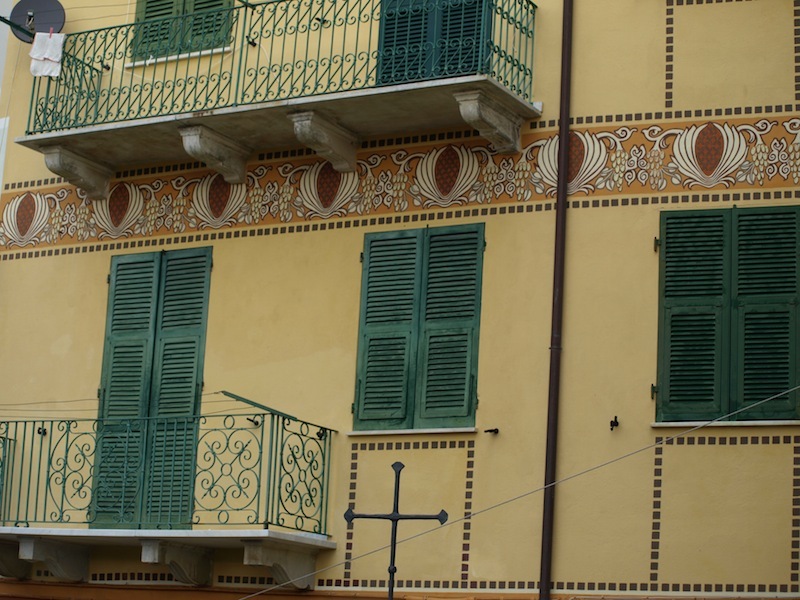 Of all the villages we have visited in the region Corniglia has some of the most interesting hodge podge additions and alterations to houses. I suspect that in the past, building regulations didn’t exist and if they did they were not enforced. 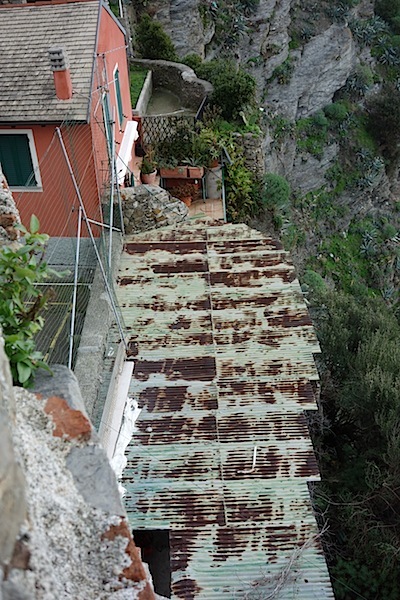 The corrugated iron roof of a café hewn out of the cliff face. The café roof in the previous photograph was over the wall behind Rahel and me. Terraces on the outskirts of town. One would have to be careful when working the cliff edge of the plot! 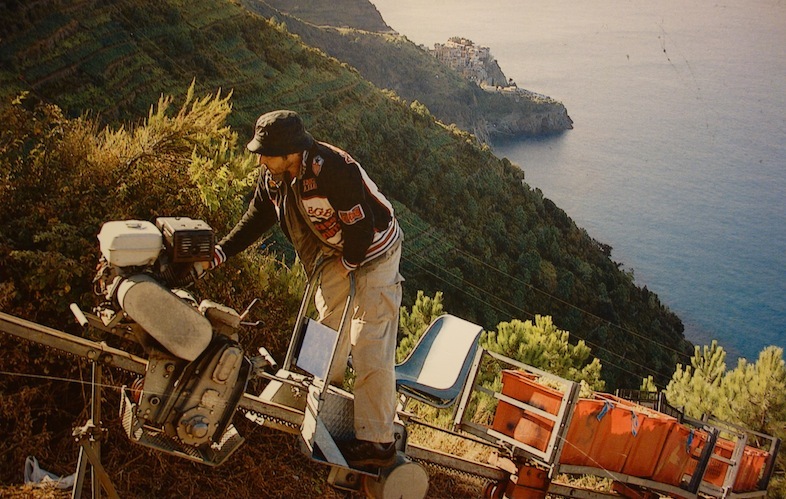 It is estimated that there are over 10 000 kilometres of retaining walls in the Cinque Terre region which adds up to a lot of hard yakka. Workers on the job. 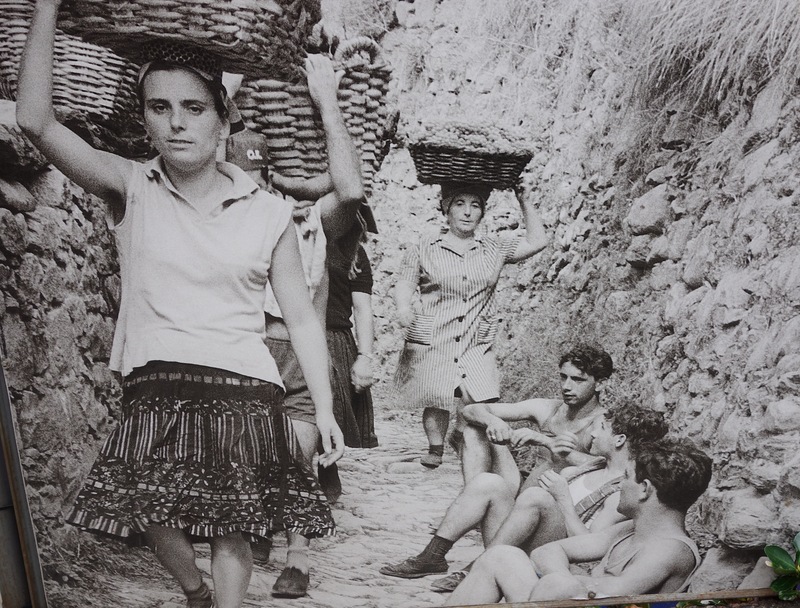 It’s interesting to note that the girls are working and the blokes are taking it easy. 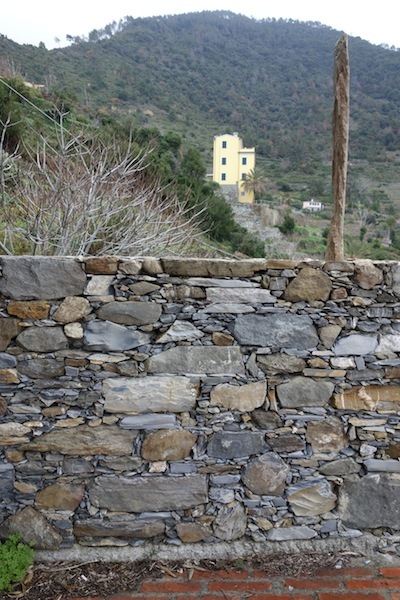 Before showing you our walk to Vernazza we best look at some of the detail in the town of Corniglia. 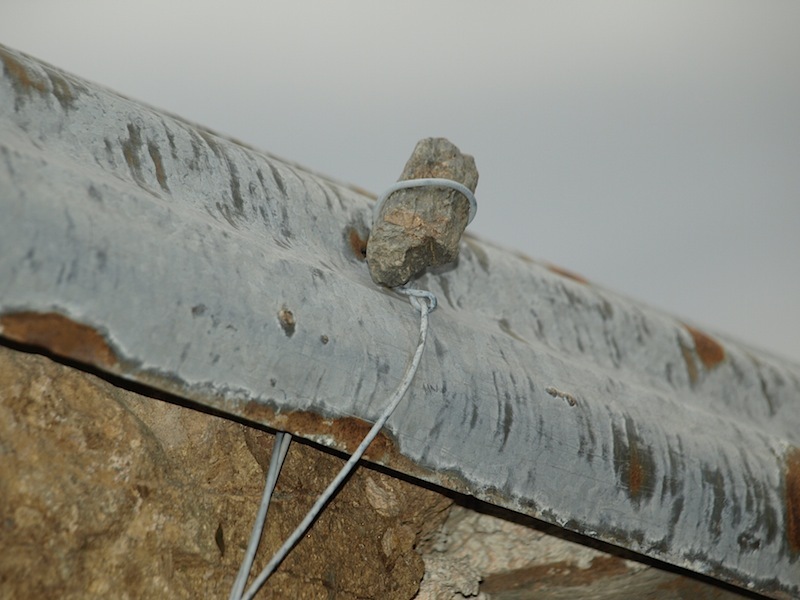 Securing a corrugated iron roof. The above image needs an explanation. The wire was passed up through a hole in the iron and back down to an anchor pin in the wall and to stop the wire tearing through the iron during big winds the stone was inserted into the wire to spread the load a bit like a mudguard washer. I suspect the stone acted as a twitch as well; improvisation at its best. 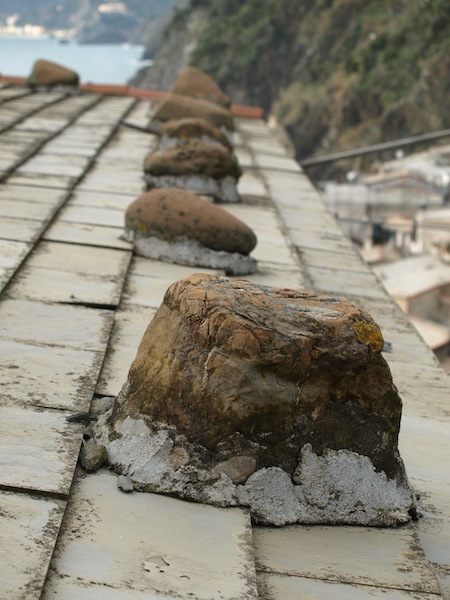 Another method of holding down a roof. 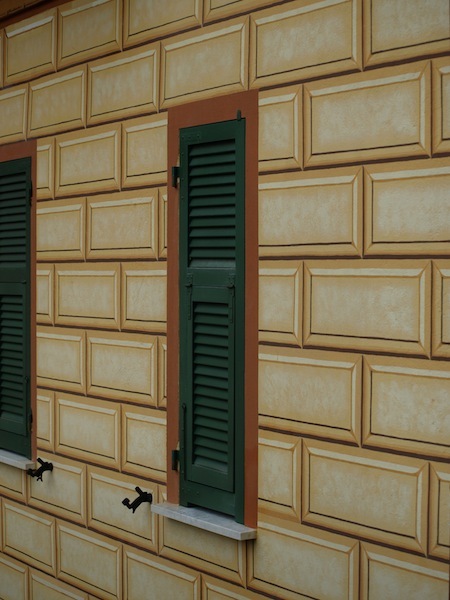 Painted joints creating an illusion on a flat surface. 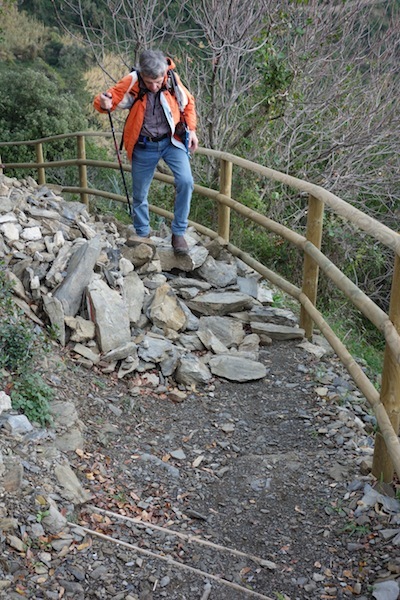 The walk from Corniglia to Vernazza was similar to other donkey trail walks we have done but this time the track was a little more precarious. We decided to walk the track, closed or not. It turned out not all that dangerous. 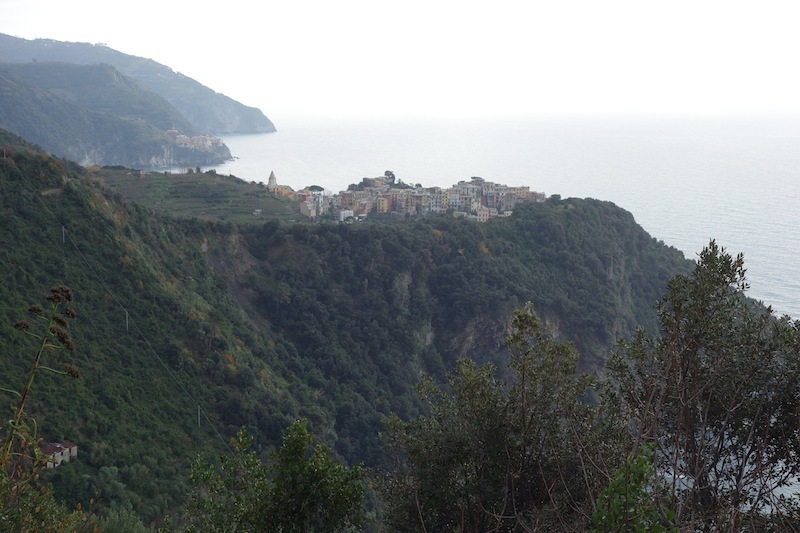 Corniglia from the walking trail. Citrus grows well on the hillsides. 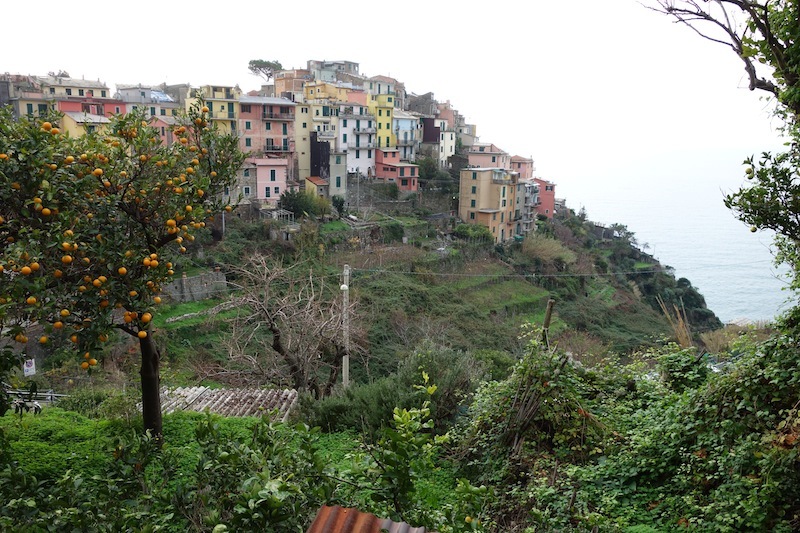 Looking back to Corniglia. 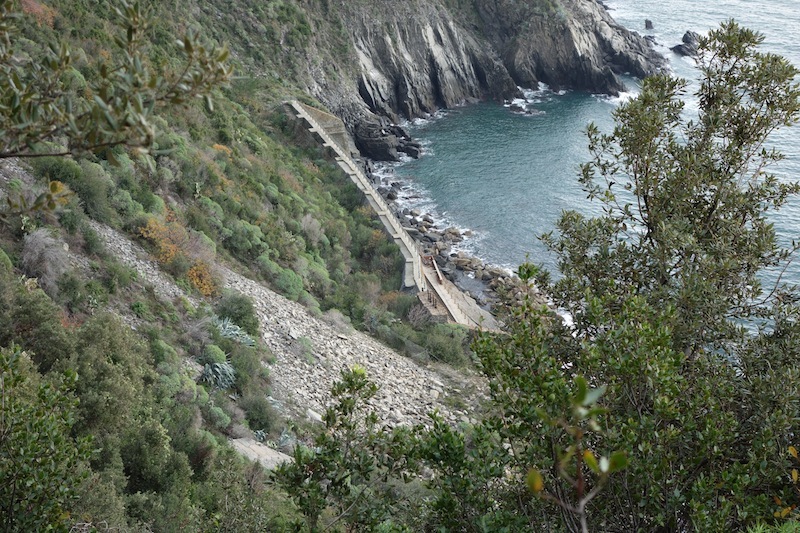 The railway station is at sea level over the cliff edge. Following are some scenes along the trail. I’m going up crab-like because the paving stones here were very slippery. One stumble and it’s all over. I wonder how many donkeys with load went over the edge. Part of the rail line at sea level. 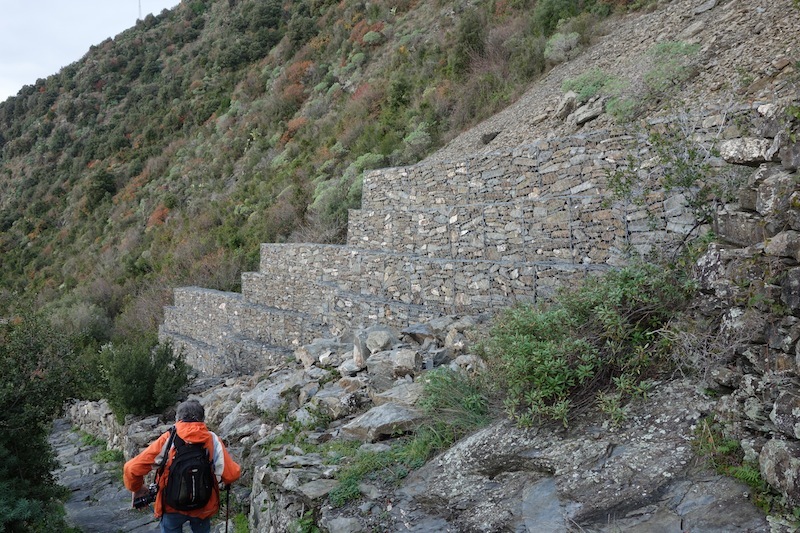 The retaining wall stops falling scree from striking passing trains. Negotiating one of the many rockfalls. Remedial action to stop landslides. Very well-built Gabian wall. National park workers will never be out of a job as the hillsides are in a constant state of movement. 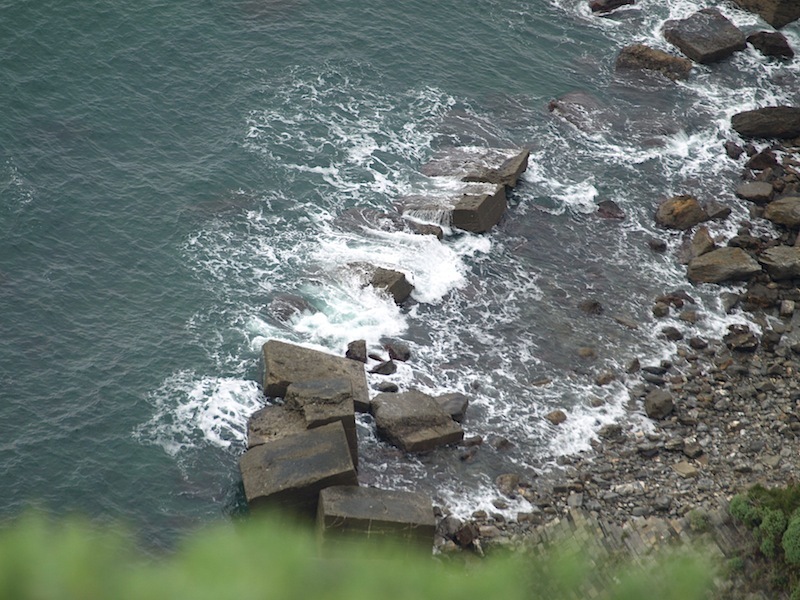 One interesting feature of the day was being able to look down to the long since abandoned railway line running along the edge of the rocky foreshores. Modern day tunnels are at a higher elevation. 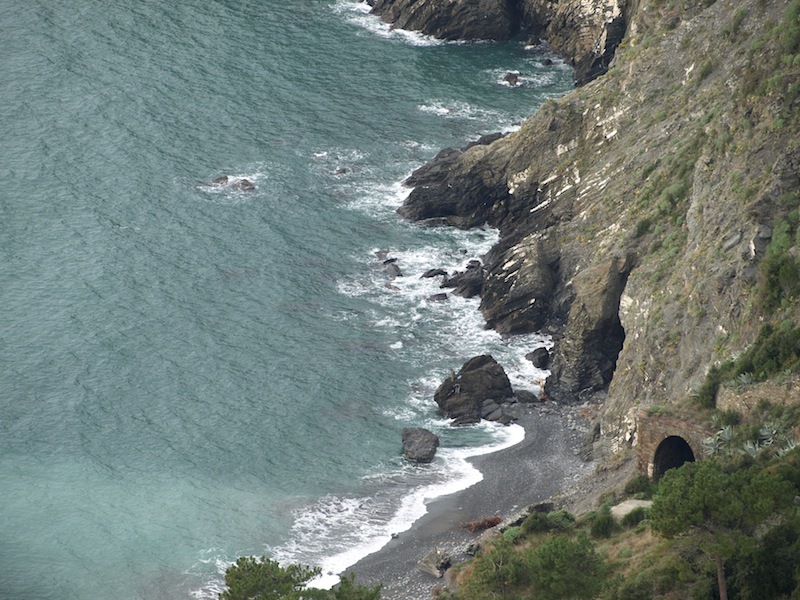 It is possible to walk through parts of the old tunnels so I’m thinking before we leave Monterosso it would be an interesting thing to do. One of the disused tunnels it is possible to walk through. The concrete blocks in the water are what is left of a railway station. Easy to understand why modern day tunnels are at a higher level. 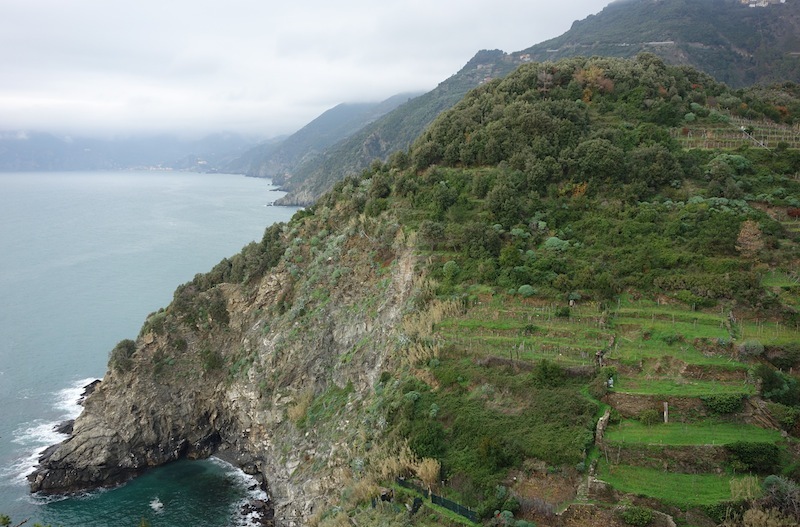 Vernazza, our destination. 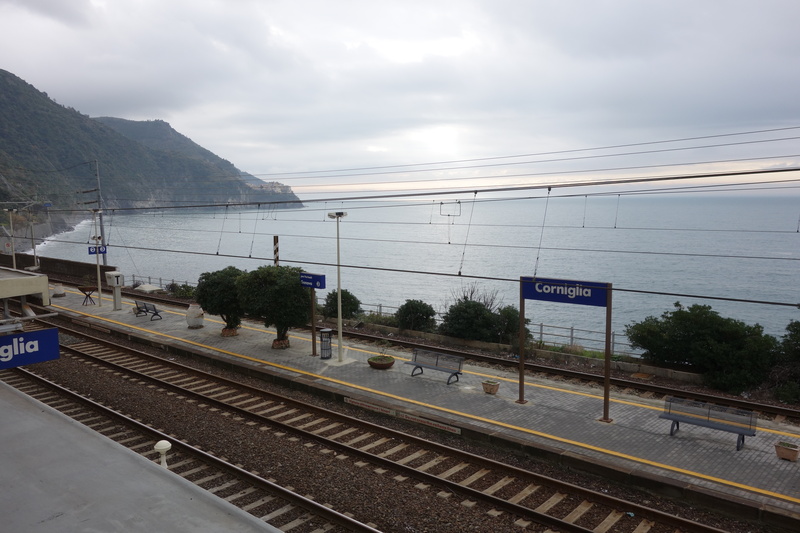 From here we caught the train back to Monterosso. 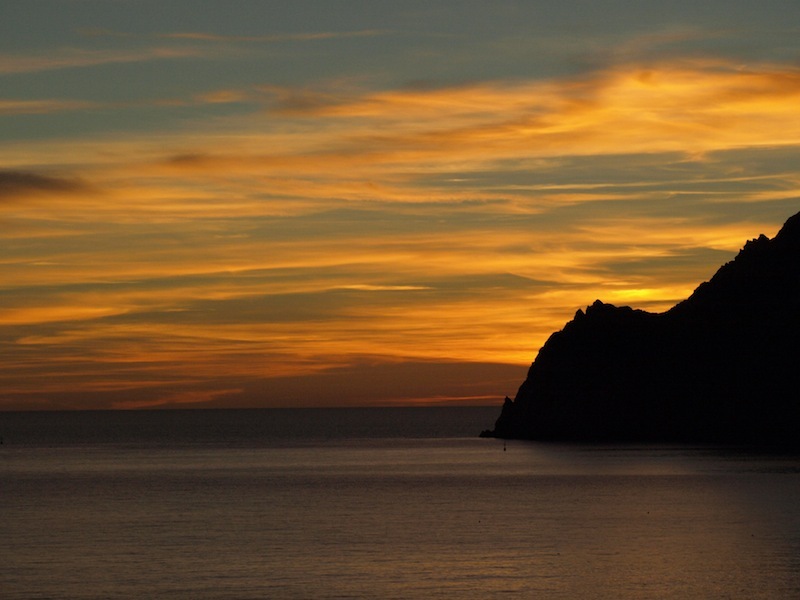 Another impressive sunset at Monterosso.